Taal Volcano is an ACTIVE volcano which last erupted in 1997. Taal Volcano is a located on the island of Luzon, about 50 km from Manila. 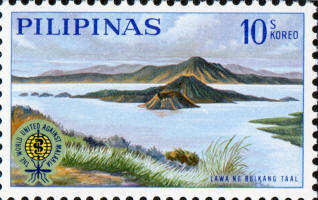 It comprises an island in Lake Taal, known as Volcano Island which is situated within a caldera formed by an earlier, very powerful eruption. The island consists of overlapping cones and craters. The volcano has erupted violently several times, causing loss of life in the areas surrounding the lake, the current death toll standing at around 5,000 to 6,000. 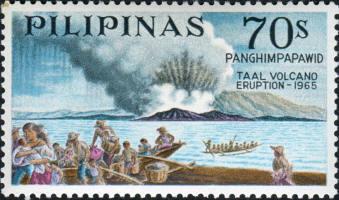 There have been 33 recorded eruptions at Taal since 1572.The greatest recorded eruption in historical times of Taal Volcano was in 1754. Another of the more devastating eruptions occurred in 1911, which claimed more than a thousand lives. 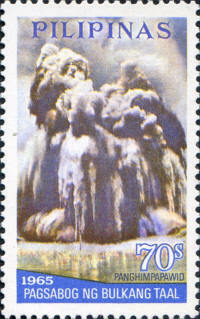 The most recent period of activity lasted from 1965 to 1977, and was characterized by the interaction of magma with the lake water, which produced violent phreatic explosions.